While most people know that the United States has had two presidents named Roosevelt, very few can identify how they were related. "Roosevelt" means "Rose of the Fields" in Dutch. The first Roosevelt, a Dutchman named Claes van Rosevelt, arrived in Nieuw Amsterdam in the middle of the 17th century. He bought a twenty-acre farm in mid-town Manhattan, including the site of the Empire State Building. By the 18th century, however, the family divided into two branches: Johannes Roosevelt (1689-1750) founded the clan in Oyster Bay, New York, while his younger brother, James Jacobus Roosevelt (1692-1776), founded the Hyde Park branch. 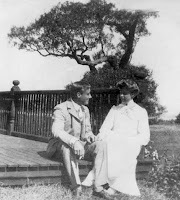 Fast forward a hundred years and you'll find that the Roosevelts were incredibly influential in New York, successful in business, and active in politics (on opposing sides: the Oyster Bay family became Republicans after the Civil War, while the Hyde Park membership remained Democrats). Among their number included an inventor, an Assistant Secretary of the Navy, a portrait painter, the co-founder of the Bank of New York, an opera singer in Paris, a diplomat, the wife of a Massachusetts governor, a famous poet and orator, a pianist and composer, a gold medal-winning yachtsman, and an Archbishop of Baltimore. Theodore Roosevelt, 26th President of the United States, was born in 1858. A sickly child, he learned all about the natural sciences and history before applying himself toward growing physically strong. He became an avid boxer when he attended Harvard. After serving as a Lieutenant Colonel in the US military during the Spanish-American War, he was elected vice president. William McKinley was assassinated in 1901, which made Roosevelt the youngest man ever to assume the presidency. He was 42. If you do the math, Theodore and Franklin were fifth cousins, which meant they were more closely related by marriage than by blood. Franklin Roosevelt, of course, went on to set his own records as the 32nd President of the United States. He was elected to more terms (four) and served more years in office (twelve) than any other leader, and presided over two monumental crises in US history: the Great Depression and World War II. He remained a Democrat, in keeping with the rest of the Hyde Park branch, but his left-wing policies single-handedly shifted the political spectrum so that "Democrat" came to mean "liberal." The Roosevelts' children did not shirk service to their country just because of their influential fathers. 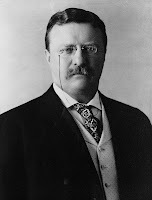 Teddy's son, Theodore Roosevelt, Jr., went on to become a brigadier general. He and his brothers Kermit and Archibald served in both world wars. Their youngest brother, Quentin, was killed in action over France in 1918. All four of FDR's sons served during WWII: James in the Marine Corps, Franklin Jr. and John in the Navy, and Elliott in the US Army Air Corps. While Teddy's and FDR's offspring have not achieved the stellar successes of their forebears, there are plenty of Roosevelts to tip the odds of future achievement in their favor. For example, Teddy Roosevelt sired six children by two wives, who then bore 11 grandchildren. Not bad, but FDR and Eleanor Roosevelt had them beat. To quote Wikipedia, their five surviving children produced among them "...nineteen marriages, fifteen divorces, and twenty-nine children." We can assume that the Roosevelts will be a part of American life for generations to come--if not in prominent political placements, then in the myriad towns (at least ten), schools (six institutes of higher learning, plus countless grade schools), streets, buildings, and public works named after these two incredibly influential leaders.